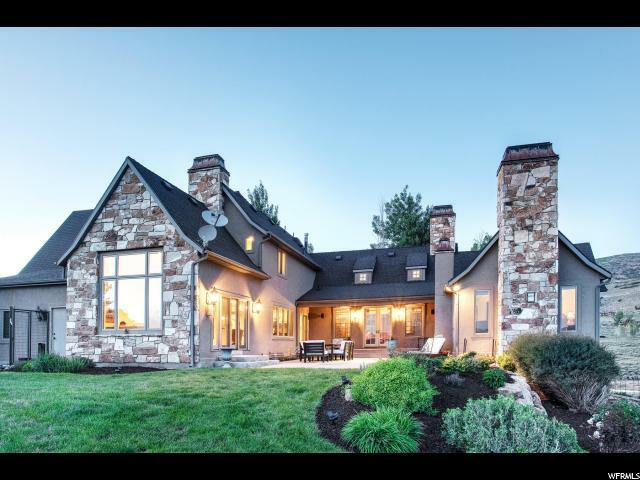 All WASATCH VIEW homes currently listed for sale in Heber City as of 04/22/2019 are shown below. You can change the search criteria at any time by pressing the 'Change Search' button below. "French Country Classic home nestled in the trees on a private 5 acre estate, allowing for the most breathtaking panoramic views of Mount Timpanogos and Deer Creek reservoir. As you enter this quality custom home you will notice the high vaulted ceilings, beautiful marble and wood pylon floors, gorgeous formal dining room and one of six stunning fireplaces, creating an inviting welcome! With exceptionally large windows, the gourmet kitchen is light, bright and sun-filled with beautiful granite countertops, double oven, fire place and a large Butler's pantry. The spacious main floor master suite with its own fireplace and heated marble bathroom floors is just off the great room with direct access to the outside patio and spectacular views. Walk-out basement has 11 foot ceilings, theater room with tiered seating, large family room, bedroom, bunk room, wine cellar and wet bar. A private guest house with a full kitchen, two bedrooms, loft, fireplace, laundry room and a two car garage."